Will this Maine shelter dog get adopted after 4 years? The purebred Staffordshire bull terrier was brought to an animal shelter in Oxford County as a stray in 2014 and has been there ever since. 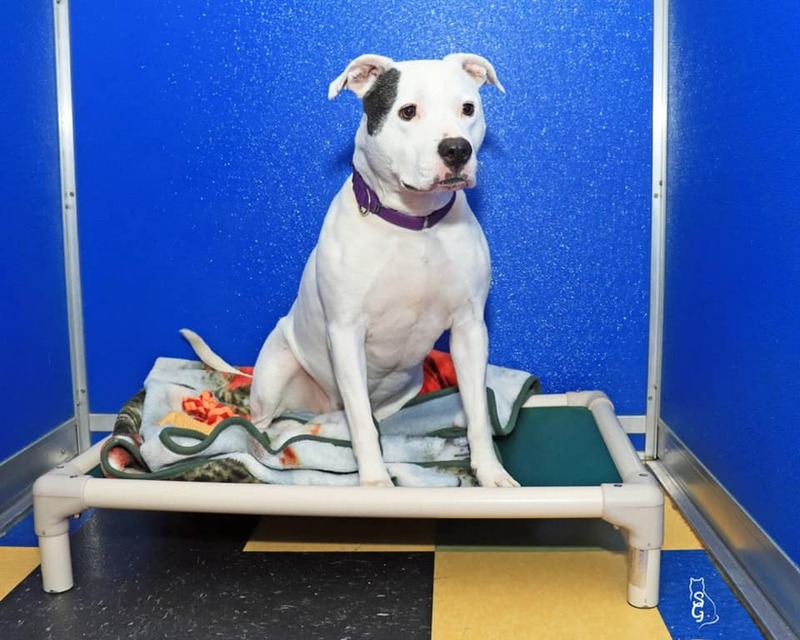 PARIS — Last week, employees of Responsible Pet Care of Oxford Hills posted on their Facebook page a photo of a white purebred Staffordshire bull terrier named Ginger with a sign draped around her neck. Within a week after its posting, the appeal had been shared thousands of times across the state. The photo was even picked up by the Huffington Post, a national news and opinion website. Ouellette said Ginger was brought to the shelter as a stray in 2014. “That makes it hard for us to figure out her background and what she was like with other people,” Ouellette said. Since the photo has been shared, Ouellette said, the shelter has been able to figure out some of Ginger’s background after a previous owner also posted on Facebook. As of Oct. 25, Ouellette said that the shelter has fielded several hundred phone calls and has received four adoption applications for Ginger. Ouellette urged those interested in adopting Ginger to read her entire bio before inquiring about her. “We get calls from people with other dogs or animals, or young children, but we’ve specifically put in her bio that she needs to be the only animal in the home,” Ouellette said. She said that Ginger needs a home that has no other animals and no young children due to her “resource guarding.” The term refers to such behaviors as growling and snapping to keep animals or humans away from some particular treasure, such as a toy or food. After filling out an application, Ouellette said that those interested in Ginger will have multiple meet-and-greets with her. According to Ginger’s bio page on the shelter’s website, she has been spayed, is house-trained and is up to date on shots. While Ginger is still in search of her forever home, Ouellette said that the attention during the last week has resulted in other animals with long tenures at the shelter being adopted. “We have a dog named Mario that has been here for two years, and just after we posted about Ginger, someone came in and adopted Mario,” Ouellette said. The employees at the shelter are confident that Ginger will find a home.